Elders and their wives from the United Kingdom. The trip had been planned for several months and grew from a request from Derrick Pringle in Zambia to come and provide some training to members in the Copperbelt region. We were excited to begin the trip knowing it would be thousands of miles of travel that would bring us in contact with many members of the Church. It gave us insight into new regions of the Church and an appreciation of the work being done by so many. The future of the United Church of God in these areas is positive. The United Church God is an international association, all members sharing a calling to preach the gospel and prepare a people for the coming spiritual harvest of firstfruits. We are investing in people by sharing the biblical truths of God’s purpose to bring many sons to glory for His family. Our trip was a part of extending that investment among the many disciples we met. We found members to be gracious, supportive and interested in their role in the mission and vision of United. Here is a little of what we were able to accomplish. The highlight of the Southern California conference was the one-day seminar where members were invited. The energy and excitement brought by those who traveled from the region was encouraging. More than 130 members attended. Having been part of these conferences for the past two years I know that members are excited about the shared responsibility to preach the gospel and prepare a people. Many ideas were discussed, including developing spiritual integrity in our young people and knitting together the congregations to the Church’s mission. After this conference we flew from Los Angeles to London for four days of meetings and discussion with the ministry and members in the United Kingdom. 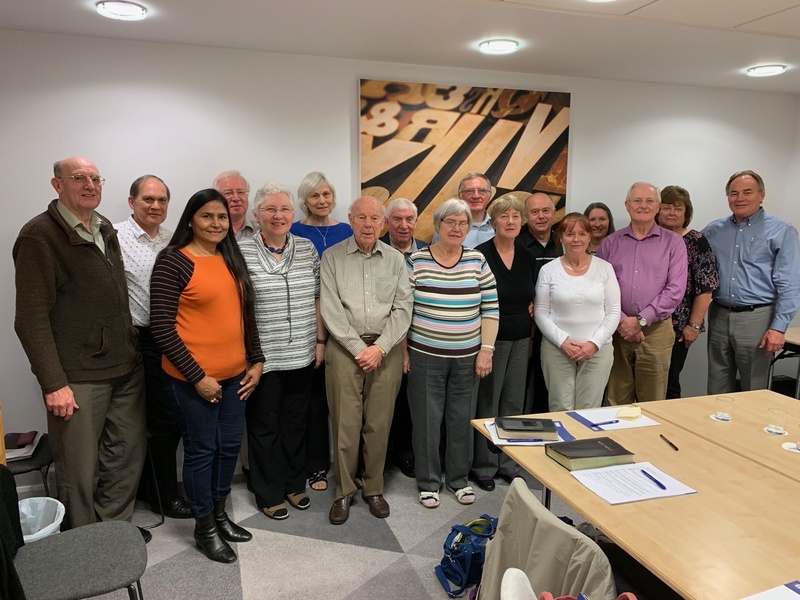 Plans for preparing future leadership as well as the challenges of preaching the gospel to an increasingly secular audience in the UK were on the agenda. We held a one-day meeting with elders and their wives. It was a delight to get better acquainted with all of them. The UK ministry have done a remarkable job in serving the scattered members. They recognize the need to accelerate plans for training another generation of leaders to ensure a continuity of service. There was one bittersweet scene during our time in England. Barry and Madhu Lavers took us by the property which once held the Ambassador College Bricket Wood campus. I had visited the campus in 1971 but Debbie had never seen the property. The buildings were in a sad state of neglect. We saw workers putting up fencing in preparation for razing the buildings. New housing is planned for the property and soon there will only be a faint reminder of what once was a thriving campus of students and faculty of Ambassador College. The Word of God endures beyond physical buildings and property. I was reminded again that we hold spiritual pearls of great price as a treasure. Before we boarded our flight for Africa we stopped by the UK office for a quick tour and a lunch. The office is nestled in a quintessential English village called Chalfont St. Giles. The staff mail literature requests and maintain the mailing list for the region. It is an efficient office serving the current needs of the Church quite well. Our next stop was the Copperbelt of northern Zambia. Our hosts, Derrick and Cherry Pringle, look after several congregations in this region. More than 35 members came together for three solid days of teaching and fellowship. I was able to cover several basic doctrines of the Church and conduct training for some speakers. I decided to focus on basic teaching for this group since having the right doctrinal foundation is critical for stable congregations. The members were eager to learn. There is reason to expect further growth in this area and our visit helped to assess the current leadership and make recommendations going forward. We spent the Sabbath with the Mufulira congregation. Their building was dedicated in 2018 by Victor Kubik and serves the area quite nicely for weekly services and as a Feast of Tabernacles site. Some work on the property continues to bring it to completion. Plans call for drilling a bore hole and electrical hook up. Our next stop was Lilongwe, the capital of Malawi. The Church has a stable congregation served by Brennan and Michala Hilgen, the LifeNets Project Managers. The Hilgens have spent two years in Malawi and will be returning to the U.S. later this year as they expect their first child. I conducted three days of classes, again focusing on doctrinal teaching and explaining Christ’s vision for His Church. I also did a class on expository preaching and evaluated sermonettes from some of the men. Gracious Mpilongwe, the pastor in Blantyre, drove up for the meeting. Two elders also came from Zimbabwe, Mike Mukarati and Mabasa Chichaya. Filius Jere and his wife came in from Chapata in eastern Zambia. Meals were provided at the Church facility. Lilongwe has a “farm” project on a plot of land about 30 kilometers from town. Last year’s Feast of Tabernacles was held there and will be again this year. Temporary buildings of bamboo have been erected, along with a bath facility and a bore hole. While it is in the beginning stages, the property has potential to serve the members well. They are growing maize and ground nuts to sell at market. The money will be used to improve the property. Our last stop on this journey was South Africa. South African pastor Roy Demont was our host. Roy hosted the Durban congregation for the Sabbath of Dec. 29 at his farm, Twin Streams, near Port Shepstone. It was a delight to renew acquaintances with the group and meet new members who have begun attending recently. Trips like this are long and exhausting. But being with members, teaching and talking makes the travel challenges fade to the background. It is important to maintain communication and create the connections that knit us together in the Body of Christ. We are becoming a Church united in its mission of preaching the gospel of Jesus Christ and the Kingdom of God.